Ruby slippers, designed by Adrian, from The Wizard of Oz (1939). FBI officials learned of the sale in late 2017. A short time later, the FBI’s Art Crime Team recovered the painting and, with the help of a court order, worked to return the piece to its rightful owners. Solomon Koninck’s 17th-century painting “A Scholar Sharpening His Quill,” was one of many treasures belonging to the family of art collector Adolphe Schloss. The artworks were stolen by the Vichy government in France 75 years ago. The painting was once in the Munich office of German leader Adolph Hitler, but it disappeared at the end of World War II. The piece showed up at Christie’s auction house in New York. Christie’s told the FBI last year that a Chilean art seller was trying to sell it. “The evidence was really overwhelming,” FBI Special Agent Chris McKeogh told the Reuters news agency. McKeogh worked to return the painting to the Schloss family in early April. “There was really no question that this was the painting in question,” he added. “People just think what we’re doing is cool,” said Carpenter. He now directs the office from the FBI’s headquarters in Washington. “So now my phone rings…weekly for folks wanting to be on the team,” he said. But it was the recovery of the “ruby slippers” that made the Art Crime Team famous. Actress Judy Garland wore them when she played Dorothy in the 1939 movie “The Wizard of Oz.” Today those shoes are worth millions of dollars. Carpenter explained that it is not the money, but the “intrinsic value” of stolen art and cultural property that helps the FBI decide if it will open a case. “People … said this is really important; this is a piece of Americana,” he said. “The real art in art (theft) is not the stealing, it’s the selling,” said Wittman. 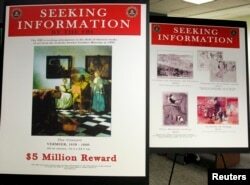 He had recovered more than $300 million in stolen art when he retired from the FBI in 2008. The Art Crime Team’s most difficult – and unsolved - case is the 1990 raid of the Isabella Stewart Gardner Museum in Boston. Thieves stole 13 pieces of art by Vermeer, Rembrandt and other artists worth half a billion dollars. “There’s not a single person on the Art Crime Team that doesn’t dream of the day that we can recover those pieces,” Carpenter said.